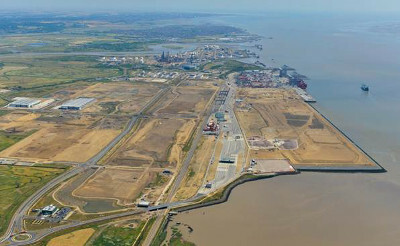 Pentalver’s new site located next to London Gateway’s port gates provides an excellent location for container services. London, UK, 31st July, 2015:- Pentalver, a leading UK inland container service operator, has opened its new five acre site at the UK’s newest deep sea container port, DP World London Gateway. Plans for the site – which will be built in two phases - were announced in January and positions Pentalver as the largest container service operator at the port. The new yard, located adjacent to the port’s main gate, can be expanded to nine acres over the coming years. Pentalver has been providing empty storage, dry repair and reefer services at its temporary premises at DP World London Gateway since April 2014. From its new site, Pentalver will offer a full range of services to vessels being handled at the terminal, including cargo handling, transport, loaded storage, empty storage, reefer services, maintenance and container refurbishment. Chris Lawrenson, Managing Director, Pentalver, said: “The opening of our permanent facility at DP World London Gateway is a significant development in the strategic future of Pentalver. With phase one now officially open, the facility will play a key role in boosting our national service offering and fulfilling our obligation to respond to the needs of customers at UK locations of their choice. Sultan Ahmed Bin Sulayem, Chairman of DP World, said: “We have been impressed by the efficiency and service provided by Pentalver and we are delighted that the permanent site is now ready for business. “DP World London Gateway’s port has been open for 22 months and last week we officially opened the DP World London Gateway Logistics Centre, the first distribution centre on our logistics park. “Being the closest deep-sea container port to two-thirds of the UK market, DP World London Gateway is already in a prime location. With the combination of the world class port with cutting edge technology, adjacent to what will become Europe’s largest logistics park, we are delivering new standards in efficiency and reliability. Since opening our landside operations, we have never stopped serving trucks due to bad weather; this is just one example of how we are setting new standards for supply chains. It operates over 200 articulated vehicles and handles 1 million TEU of containers each year. Pentalver supplies new and used containers for sale, including bespoke modifications; whilst its cargo management department offers end-to-end multimodal solutions by road, rail, sea and air, including ship and aircraft chartering. Since 1999 Pentalver Container Sales has imported over 70,000 new containers for the self-storage market in addition to offering refurbished containers of various sizes and types. The company’s dedicated workshop team converts containers into offices, stables, workshops and numerous other bespoke applications including biomass boiler houses. Opened Q4 2013, DP World London Gateway is the UK’s newest, major deep-sea container port adjacent to Europe’s largest logistics park. Owned and operated by DP World and situated on the north bank of the River Thames, London Gateway provides unrivalled deep-sea shipping access to the largest consumer markets in the UK. Located just 25 miles from Central London, with its superior operational systems and service, ensure ships load and unload as fast as possible, making London Gateway a world class asset for the UK.